Amazon.com description: Product Description: An essential and definitive collection of the Nobel Prize for Literature winner's finest essays, reviews, reminiscences and interviews from the 1950s, 1960s and 1970s. 'The novelist talks as an individual to individuals, in a small personal voice. In an age of committee art, public art, people may begin to feel again a need for the small personal voice; and this will feed confidence into writers and, with confidence because of the knowledge of being needed, the warmth and humanity, and love of people which is essential for a great age of literature.' In this collection of her non-fiction, Lessing's own life and work are the subject of a number of pieces, as are fellow writers such as Isak Dinesen and Kurt Vonnegut. There are essays on Malcolm X and Sufism, discussions of the responsibility of the artist, thoughts on her exile from Southern Rhodesia, and a fascinating memoir of her fraught relationship with her mother. 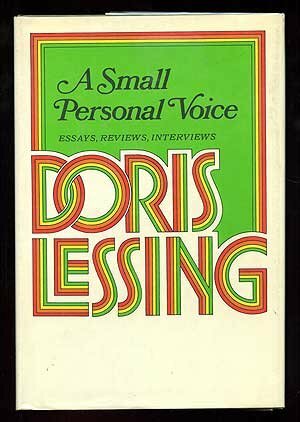 Lit throughout by Doris Lessing's desire for truth-telling, 'A Small Personal Voice' is both an important collection of writings by and a self-portrait of one of the most significant writers of the past century.